January 3, 2018  This special radio hour features Pete Seeger's music throughout his career, plus an interview during a visit to his home, where he shared his anecdotes, spirit and zest for life with Fiona Ritchie. September 11, 2017  The decision follows a year-long lawsuit filed by a documentarian against music publishers and folk singers, including the late Pete Seeger, who copyrighted the civil rights anthem in the 1960s. December 29, 2014  NPR Music remembers musicians — singers, songwriters, instrumentalists — and other visionaries we lost in 2014. Explore and celebrate their musical legacies. 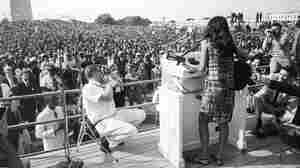 August 2, 2009  Pete Seeger and grandson Tao Rodriguez-Seeger led the festivities with Joan Baez, Ben Jaffe and members of Balfa Toujours. 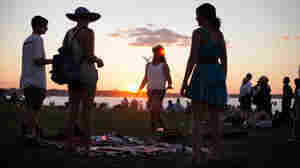 July 30, 2009  All Songs Considered host Bob Boilen recently spoke with festival producer Jay Sweet about what's in store for the Newport Folk Festival. February 1, 2014  Scott Simon hosts a special concert, recorded in 2005, with interviews and performances by Seeger and a cast of gifted artists. 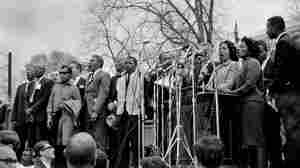 Participants include Judy Collins, Ani DiFranco, Bruce Cockburn, Bernice Johnson Reagon, Natalie Merchant, Janis Ian, Holly Near and more. January 28, 2014  The American folk icon sang many inspirational songs during his 94 years. 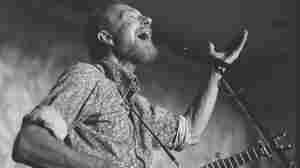 Kim Ruehl of FolkAlley.com looks at the career of Pete Seeger through five songs that characterize his most lasting legacy. 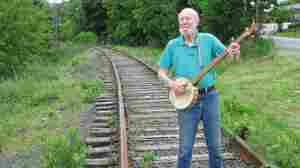 January 28, 2014  Seeger believed songs were a way of binding people to a cause. He talks about fellow folk music icon Woody Guthrie and jumping railroad cars in an archival interview from 1985. 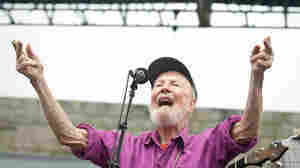 January 28, 2014  Pete Seeger was an activist for many causes, but among them was a passionate belief in the importance and value of public singing. 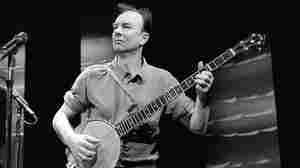 January 28, 2014  A tireless campaigner for his own vision of a utopia marked by peace and togetherness, Pete Seeger's tools were his songs, his voice, his enthusiasm and his musical instruments. July 11, 2013  The couple shared a lifetime of collaboration. 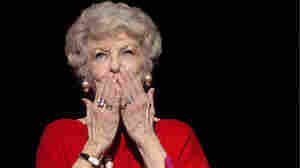 She died Tuesday, just shy of their 70th wedding anniversary. 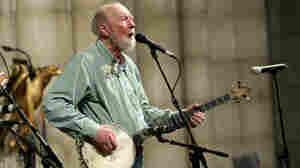 May 19, 2006  We listen back to a previous interview with the folk singer and political activist Pete Seeger. He wrote or co-wrote "If I Had A Hammer," "Where Have All the Flowers Gone" and "Turn, Turn, Turn." He also made popular dozens of other folk songs, many of which appear on the latest Bruce Springsteen album, We Shall Overcome:The Seeger Sessions. This segment originally aired on Jan. 25, 1984. April 26, 2006  Rock critic Ken Tucker reviews Bruce Springsteen's new album, "We Shall Overcome: The Seeger Sessions," which features Springsteen singing folk songs made famous by Pete Seeger. April 26, 2006  Bruce Springsteen reinterprets the songbook of American folk legend Pete Seeger on his album We Shall Overcome. He talks about Seeger's music, the creative process and the importance of an adventurous audience. 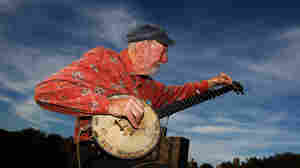 July 1, 2005  Legendary folk singer Pete Seeger talks with Scott Simon about his career. Also, hear a two-hour tribute concert featuring Natalie Merchant, Bruce Cockburn, Judy Collins and others. October 27, 2012  The folk singer, environmentalist and activist remains active and busy. He splits the firewood that heats his home overlooking the Hudson River, and he's just published a book of his collected writings and released two new albums. 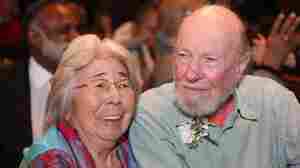 August 12, 2010  Pete Seeger's music helped popularize the folk music genre. 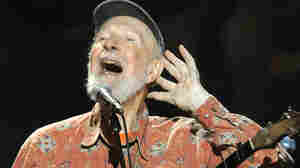 For eight decades, Seeger has inspired generations of fans with songs about peace, social justice and civil rights. 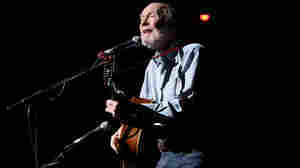 For his latest album, Tomorrow's Children, Seeger plays and sings along with a chorus of kids from Beacon, N.Y.